As a DJ, it’s almost guaranteed that you will regularly frequent environments where drinking alcohol is a common and popular practice. Drinking and DJing within reasonable limits is normally OK for most DJs but would you be able to tell if you’re drinking to much or if it were having a negative impact on your performance? As the remaining Super Clubs adjust to the new club land culture and find new ways to bring in the crowds without blowing their budget on big names. Starting out DJ's need to stand out to the super clubs as a professional alternative if they want a slice of the action; and that means staying sober. It is telling that nearly all established DJs with a few years of experience or more will only have a drink after finishing a set, whereas some abstain all together, but when alcohol is such a big part of nightlife culture it can be very hard fight the peer pressure or turn down all those offers of a free drink. Be warned though because if you are playing 3 to 5 gigs a week and drinking at every one it could have a negative impact on your performance and it would eventually have a negative impact on your health. And when you are abroad, playing in unfamiliar environments, at huge festivals like The Burning Man or club land mecca's such as Ibiza its even harder to drink and stay within your set limits. However, an alcoholic drink before an important gig can help steady the nerves and give you that boost of confidence needed to face your fears but if you exceed your limit it will have mostly a negative effect and if you get into the habit of using alcohol to get through all your DJ sets you will begin to believe that it's impossible to play a set without the use of alcohol. If you need a bit of Dutch courage you must be smart about it. If you are already feeling confident save that first drink for when you finish and if you must drink, keep it in moderation. It is also important to remember that first impressions count for a lot and if you are booked for a gig the person paying you will expect you to give it your best and that means staying sober. An intoxicated DJ will be unaware of how drunk they are coming across to everyone and this often results in them making a scene they live to regret. If you are serious about establishing your name as a DJ by getting regular paid gigs you will want to avoid making this same mistake. Remember what it is like when a drunk fan from the audience starts bugging you during your set. They are clearly unaware of how annoying they are being and how drunk they are coming across. Imagine how much worse it would be if a DJ got this drunk. The audience would notice very quickly and it's very likely that some of them will be live streaming you on social media. "LSA have created this safety guide to help touring DJs avoid the dangers alcohol presents, when playing in environments where the excessive drinking of alcohol is a common and popular practice". "How do you DJ without getting intoxicated"? 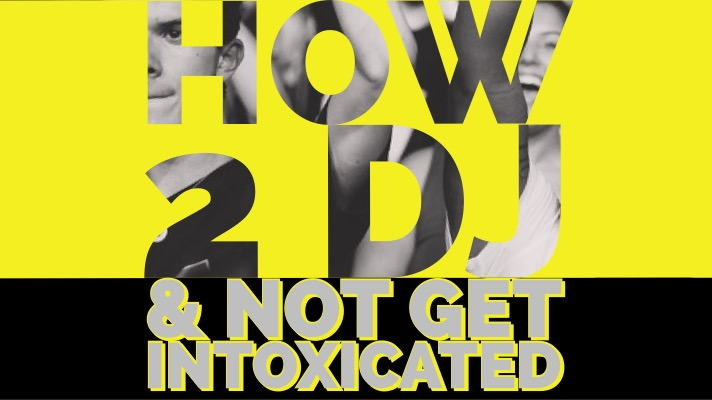 The obvious answer to this question is to do what most experience touring DJs do and abstain from drinking alcohol all together until after their set but if you are really feeling nervous and anxious about playing to a crowd and you're worried it will have a negative impact on your performance we have the perfect guide for using alcohol to settle your nerves safely. It sounds a bit over the top but trust me, without a plan you will stumble at the first hurdle and after that it is pretty much a slippery slope. Think about the environment you are going to DJ in and make an assessment of how boozy will it be? Ask yourself the following questions so you are fully prepared to effectively deal with any situation involving alcohol. · Will you be able to choose a drink that accurately informs you of it alcohol content? · What type of drink is safest for you to drink that won't impair your performance? · How many drinks can you have before/during your set without it negatively affecting your performance? · Is it likely that you will be offered alcohol a lot? · Will you see people that will expect you to have a drink with them? · Will you be able to turn down multiple offers to buy you a drink without causing offence? · Will you be expected to join in on a group round of shots? · Will you miss out on some valuable group bonding by not participating in a group round of shots? "Here are 6 tips for helping you stick to your plan without it causing any issues". 1.Make sure you have a full or half full soft drink that looks like it could be an alcoholic drink so you can use it to turn down offers from anyone insisting that you have a boozy drink. If you can reply by saying I already have one it's likely that their insistence will stop there. 2.Have a charity box for a good cause your audience will be likely to care about, and use it as an alternative to buying you a drink. Most people wishing to buy you a drink do so because they want to show their appreciation and they won't be satisfied until its accepted. This way allows for a satisfactory alternative for them to show their appreciation. It is also a great way to support and raise awareness for a charitable cause. 3.Never let your drink out of your sight or if you are worried about keeping it to close to the equipment try to keep it in a seal caped bottle and out of reach from anyone other than yourself. Make your drink easily identifiable so there is no chance of it becoming confused with anyone else’s. It can be all to easy to accidentally to consume something you didn’t mean to in a party environment especially when you’re busy DJing. 4.Make friends with a friendly bartender and arrange for one of them to prepare any shots that are ordered for you, to not contain alcohol. You can make it worth their while by offering them your alcoholic shot. You can then drink your shot without anyone knowing yours is alcohol free. This allows you to join in with some essential group bonding without exceeding the limit you set yourself. 5.Choose the type of alcoholic drink you will have and stick to it. Chose a quality drink that you can accurately calculate its alcohol content. Avoid choosing cheap, low quality alcohol because it is likely to contain a higher concentration of impurities know as‘congeners’ which are likely to give you a headache or the early onset of a hangover. Congeners are chemicals that are produced in the distillation process giving many alcoholic drinks their colour and flavour, so choosing white spirits, like gin and vodka over dark spirits such as rum or bourbon can be a smart way to avoid consuming to many ‘congeners’. Carbonated alcoholic drinks are to also be avoided because the alcohol in carbonated drinks gets absorbed faster than in non-carbonated drinks. 6.Make sure you eat properly so you don’t go into a job with an empty stomach. Drink water regularly so you are fully hydrated and eat a sensible meal to make sure you are in the best physical condition before playing a set. If you go into a set feeling hungry or dehydrated you will be far more likely to increase your sensitivity to any alcohol you consumed, especially if you are feeling nervous. You want to make sure your body is in tiptop condition before doing anything that demands your concentration. "Preparing in this way will help you to respond to each situation involving alcohol sensibly without you having to avoid taking part in the party atmosphere. By following this guide, the best DJ practices and the DJ etiquettes you will be well on your way to becoming a successful DJ". If you are interested in learning more about becoming a DJ or more about perfecting your technical and creative skills in music production or as a touring DJ visit our homepage and explore our blog. LSA has helped thousands of people, of all ages and backgrounds turn their interest in DJing and music production into a passion and a career. Explore our website and discover what we can do for you.